OMG! How I've been waiting for this one! But oh so worth it!! Charley is being Charlie and while the world around her is in choas, she's mourning the loss of her ability to drink coffee!! LOL! Yet, she acknowledges its for a very good cause! Yet, she swears she's going to ground the kid for life as soon as she arrives. Typical Charley and this is why I adore her!! The mystery Charley is trying to solve really kept you on your toes and you were trying to figure out what the link was and when its revealed - holy molely!! Then of course there is the fact that her Dad is MIA! Really bad timing. Oh and yeah, the dead ex-BFF that you want to let Reyes handle her just so you and Charley can enjoy two minutes of peace and quiet. But YOU KNOW there's more to it if Darynda is including this in the book. And yes, there! A few twist and turns and you're left wanting more and more and more! The characters are beautifully written and if they really existed, I so would want them in my life!! The stories are magically crafted with a dash of sass and sarcasism! The humour is well balanced with realism. Narrator's Review: LOVED IT! Lorelei is the perfect narrator for this series! She does a phenomenal job of bringing the characters to life and making you, the listener, part of the ride!! Overall, an excellent read that keeps you wanting more!! Can't wait for the next installment!! 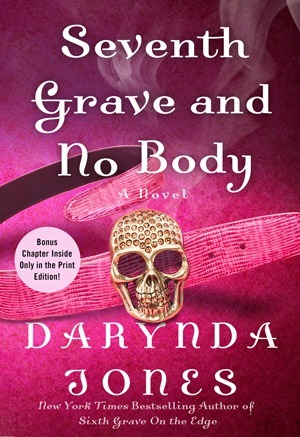 This is the reason why Darynda Jones is an AUTO BUY author for me! She writes it, I read it! !